It’s August and there’s a lot blooming in the wood open fields, pastures and prairies of the upper Midwest: many types of Asters and Goldenrods, Sow Thistle, Ragweeds, Compass Plant, Coneflowers, Cup Plant, Horseweed, Boneset, Joe Pye Weed, Chicory, Liastris, Brown and Black Eyed Susans, What do all these plants have in common? They are all members of the Asteraceae family (also known as the Compositae family), what these authors, using common language call the Sunflower family. With 23,000 worldwide species, this is one of earth’s largest plant families and besides the late summer blooming plants listed above this family also include the eponymous Sunflower and many plants familiar and desirable to herbalists including Burdock, Dandelion, Pineapple Weed, Prickly and Wild Lettuce, Wormwood and Yarrow. The book The Sunflower Family in the Upper Midwest is all about this plant family and is one of the best plant books I’ve come across in the last few years and I highly recommend it to all students of plant identification, foragers and herbalists and plant lovers. According to the authors Thomas M. Antonia and Susanne Masi, plants from this family alone, account for over 10 percent of the region’s flora. The authors define the upper Midwest as six state region including Illinois, Indiana, Iowa Michigan, Minnesota and Wisconsin. The book includes monographs of 150 species from 55 genera (plural for genus) and the authors write in their introduction that “approximately one-half of the Asteraceae species found in the region are included in this book.” From the list of Asteraceae plants like Goldenrod, Burdock and Dandelion you should have a pretty good sense of why this plant family makes up such a large part of our floral landscape–the sunflower family plants are particularly good at reproduction. Dandelion is the archetypal example….so many seeds, so easily spread. 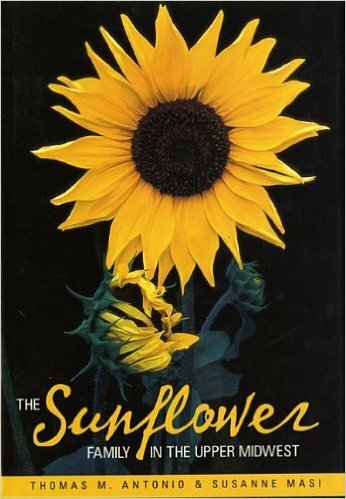 Sunflower family plants are considered a highly evolved plant family and this book explains to the reader the unique floral structures of the sunflower family. What we call the dandelion flower is, in fact, hundreds of individual flowers (called florets) grouped together into what to our eyes, and the eyes of pollinating insects and birds, constitutes a single flower. What appears to be a petal is a fully-functioning flower. Similarly, the Echinacea “flower” is made up of many, many individual florets. Each poky brown bit in the center is a tubular shaped disc flower and each pink “petal” is a ray flower. Within the family there are three common flower head arrangements: radial (ray floret only) flower heads, like Dandelion, discoid(disc floret only) like Tansy and Pineapple Weed, or ligulate (which means both ray and disc like Echinacea and Sunflower. This is where the old name Compositae comes from–each flower head is a composite of many individual florets. This stuff is complex, but the authors do a good job of describing the botany of this plant family and if you stick with it you will be rewarded with a good understanding of these plants. After the introduction to the botany of Sunflower family the bulk of the book is made up of plant profiles. The authors organize the plants first by bloom color. There are four sections:White or Green, White with Yellow Centers, Yellow or Yellow with Brown Centers and Blue, Violet, Rose or Pink. In my experience, as a plant book reader who is not a trained botanist, how a book is organized can make or break whether I find the book useful and delightful to read and browse and use in my life learning plants or something that I just put aside. I really appreciate that they decided that the first level of organization for the 150 plants profiled is bloom color. It makes browsing and using this book for i.d. purposes so much more user friendly than a more standard taxonomic classification. Within each color section, the plants are listed alphabetically by genus and then by species. Therefore, all Goldenrods are Solidago and then alphabetic by species, S. caesia, S. canadensis, S. flexicaulis, and so forth. The plant profiles include scientific name, common name, a brief explanation of what the scientific name means, native or non-native status, color, height, bloom time, habitat and a note on use in the garden. This is followed by several paragraphs about the plant. These paragraphs might include botanical, natural history, economic of food uses, and sometimes just a teeny bit of ethnobotany. Do not expect these kind of books to teach you herbal medicine or how to prepare a plant for dinner. We have great herbals and foraging books for those purposes. Do always take into account a plants status as abundant (and even weedy or invasive) or at risk or endangered when harvesting. We herbalist need to behave as responsible stewards of the earth with our harvesting activities. The photos are great. Each plant monograph includes 2-4 high quality photos. Finally, this book has one of my favorite plant book features–the distribution map. In the corner of each plant profile is a small map of the six state region with all the county boundaries and the counties in which the plant profiled has been proven to be found are shaded green. The authors note in the introduction that shading does not equal abundance and that lack of shading does not mean this plant has never grown in a particular county. Nevertheless, I love distribution maps. If the plant you think you found in St. Paul, or Rochester only has one shaded area on the map and it’s the Arrowhead region or it’s the shoreline of Lake Michigan, try again. That’s probably not your plant. I find these maps to be one more tool to help in the narrowing down process that is plant identification for many of us. There’s a variety of appendixes including a glossary and key. This book is a big, heavy hardcover and you probably won’t throw it in your backpack when you head out in the field but it definitely deserves a place on your bookshelf. You can read more about the Asteraceae family on Thomas Elpel’s fine website about plant families.